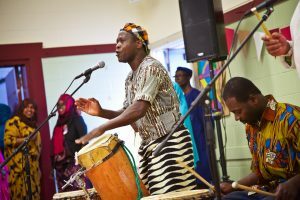 African Beats Workshop: Come shake, rattle and roll with two African teaching artists who will engage participants in learning basic West African rhythms with hands-on use of drums, bells, shakers and clapping. This interactive workshop will entertain and educate for all ages. African Showcase Performance: Travel to Africa for the day! Teaching artists from Gansango Music & Dance Company perform music and dance from West Africa. This interactive performance will entertain and educate, blending contemporary and traditional dance with drumming, song and audience participation. Summer calendar will be updated in April 2019.